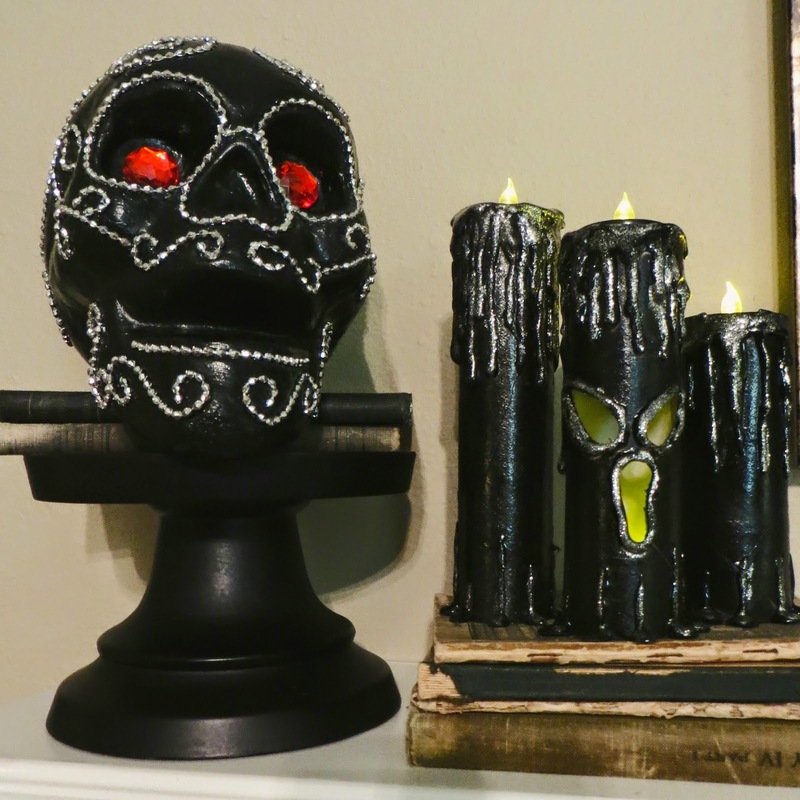 There is something about Halloween that calls for creepy candles and this year that seems to be our focus. 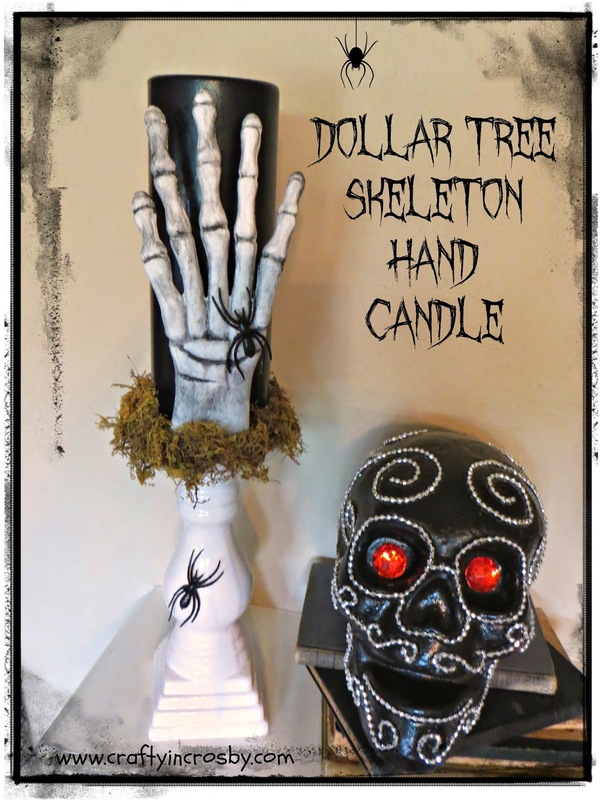 This creepy but classy candle started with a glow in the dark skeleton hand from Dollar Tree. 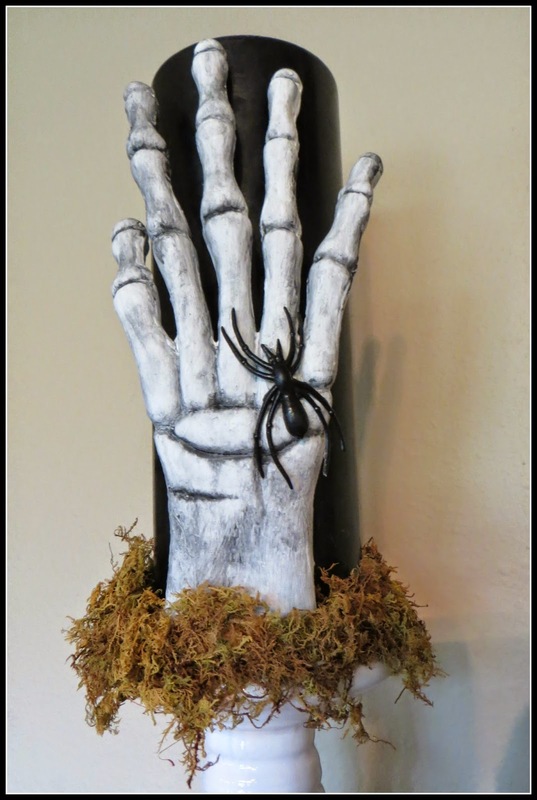 The hand comes with a stake to use as yard decoration. I tried it outside, but it just didn't glow enough for me, but I with a bit of paint, it makes the perfect candle decoration. Didn't take many pictures of the process, but it is pretty easy. 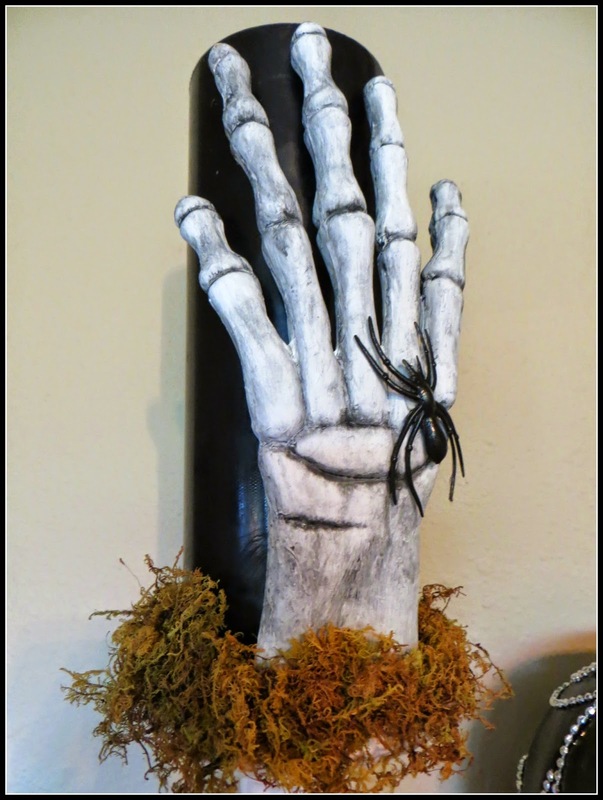 Just cut the bottom part of the hand off - I used our handy hot knife, then paint the hand white and highlight with watered down black paint. 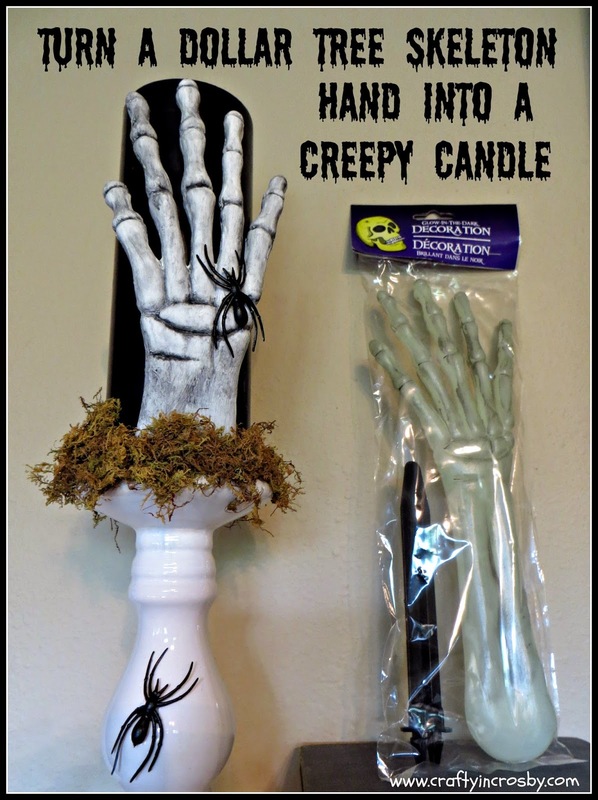 a creepy, but classy Halloween candle. 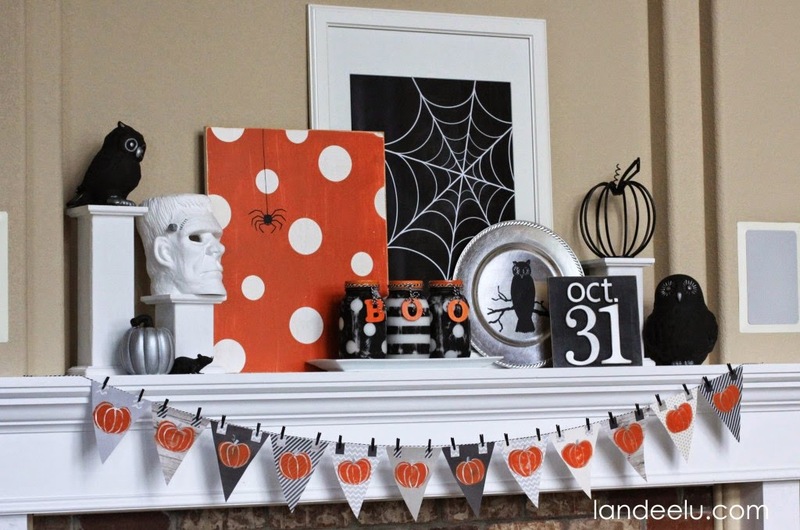 You would be hard pressed to find an area of our home that we have decorated for Halloween without some revamped Dollar Tree decorations in it. What can I say, we are cheap!!! 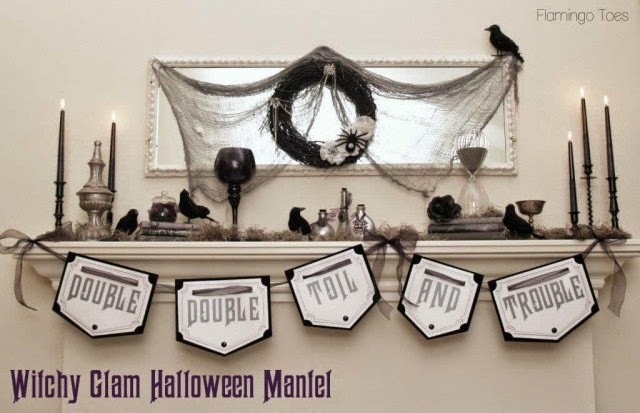 We will be sharing more Dollar Tree Decorations over the next week. 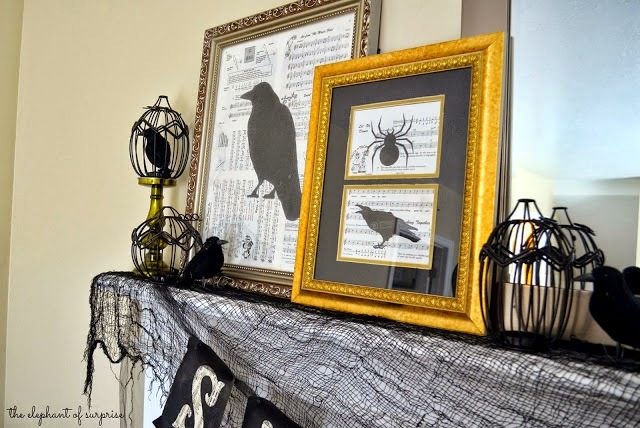 Only 32 more days until Halloween so stop back by for more frugal decorating ideas! 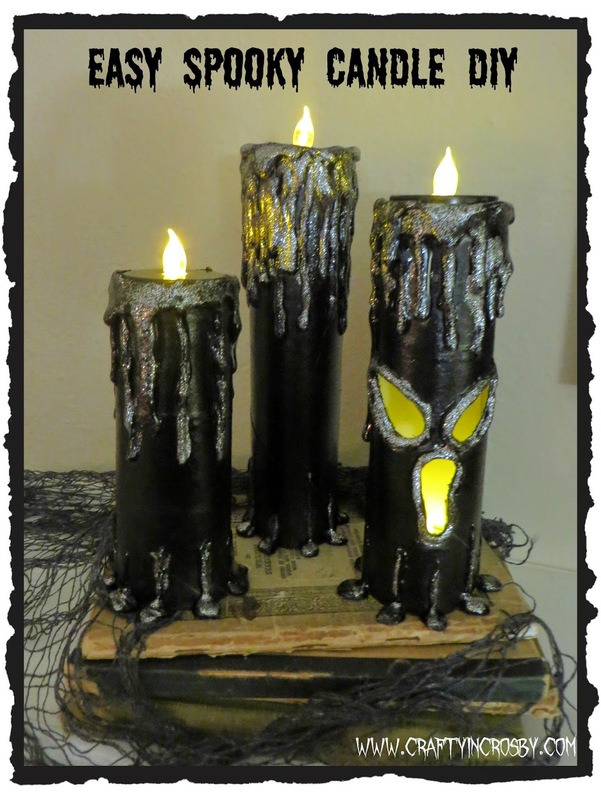 If you saw our Halloween 2014 Pinterest Picks a few weeks back, you saw the Halloween Candles by Thrifty Crafty Girl. Our candles were inspired by her's and House of Dewberry's. 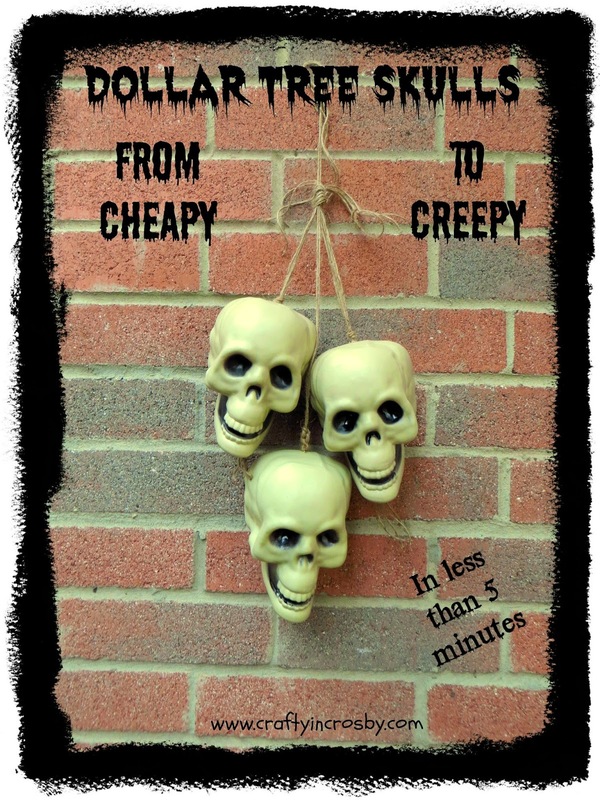 These are probably some of the most frugal and creepy Halloween decorations we have made. 5. 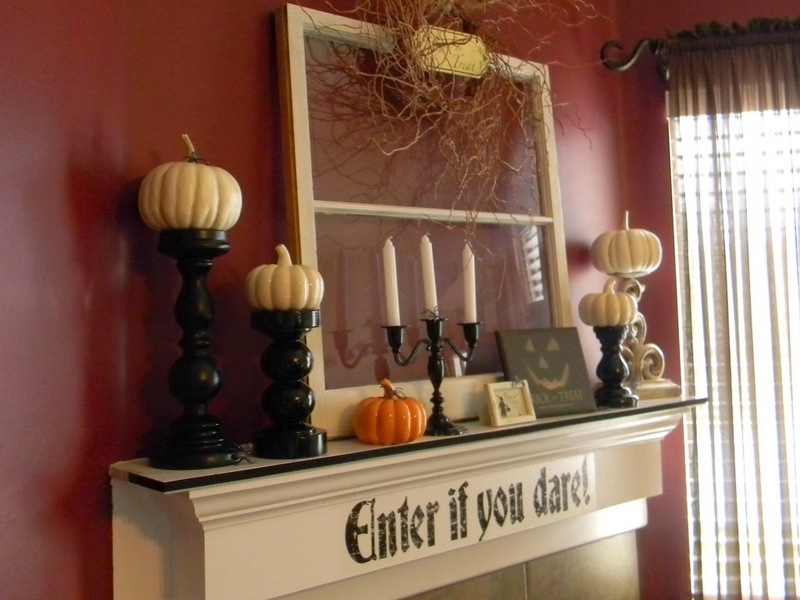 Black paint - I used spray paint but craft paint would work too. 6. Silver paint - I used glitter nail polish because it was easy! 8. Exacto knife if you are going to cut out a face. 1. 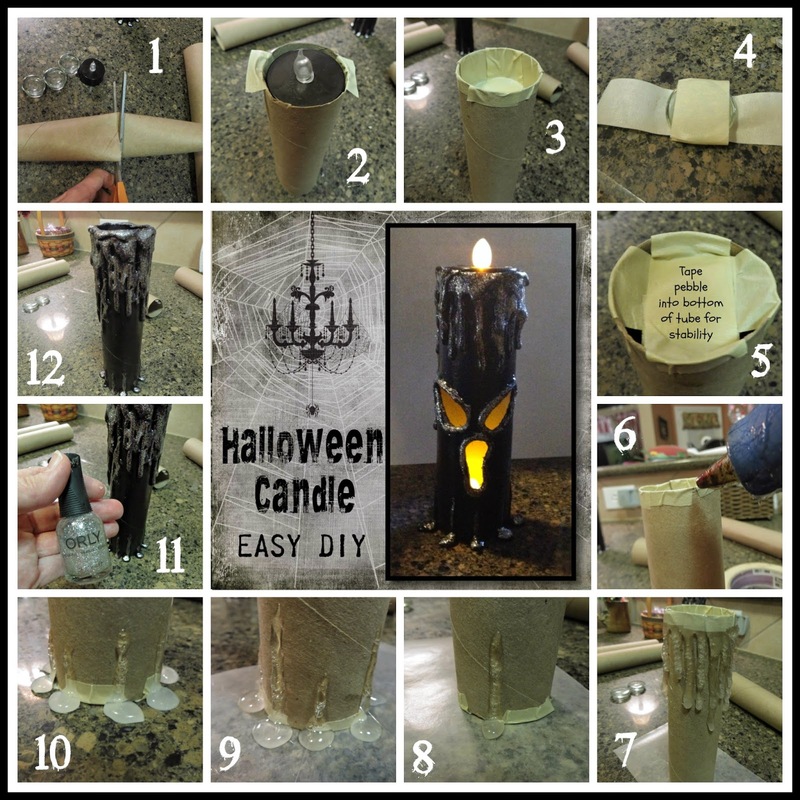 As soon as the drips on the bottom of the candle are dry to the touch, remove the wax paper. 2. 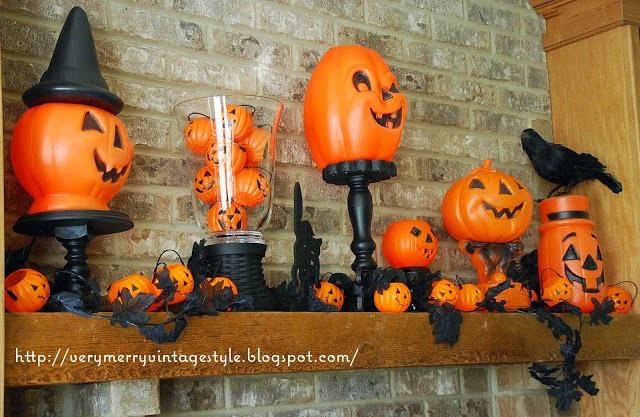 If you have drips on the bottom that aren't in the shape you want (hot glue can leave strings and little points) just cut them off with scissors. 3. If you are going to cut a face into the candle, don't tape the rock in the bottom as you will just sit the candlestick over a tea light. 4. 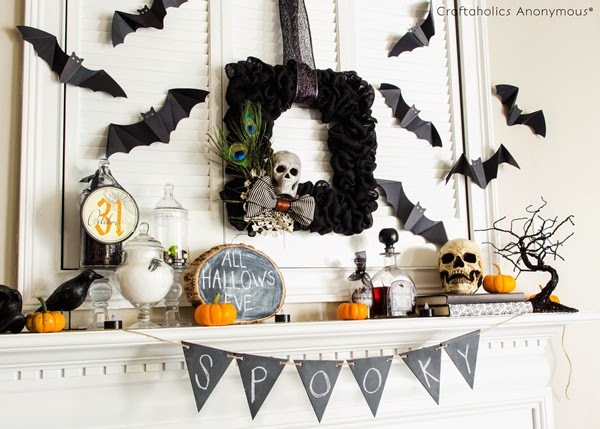 After you cut out the face and paint the candle, slide a small strip of white paper into the candlestick and affix it with tape. 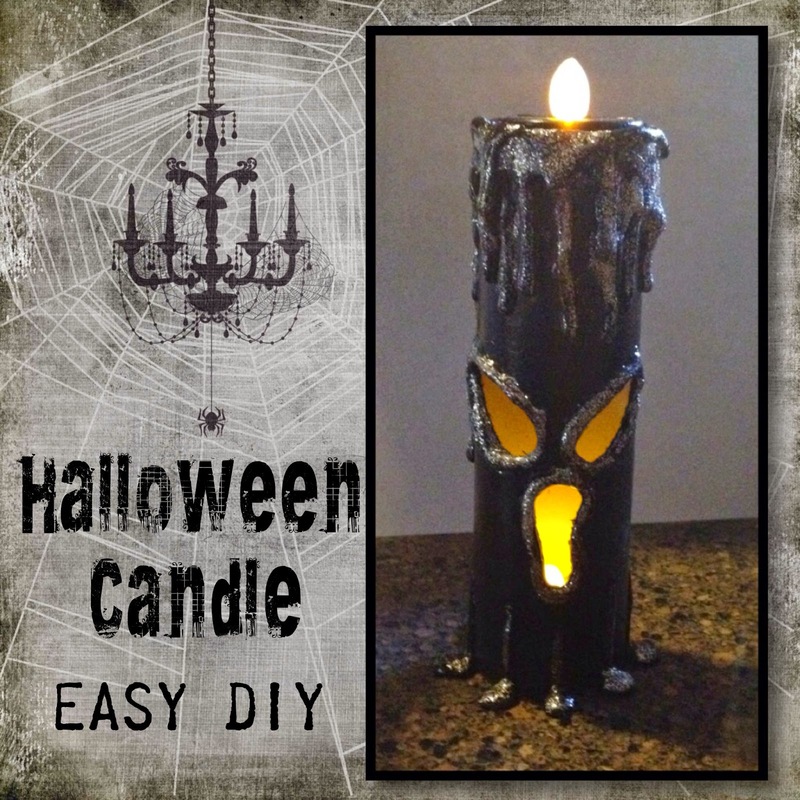 This will help the light from the candle reflect better and give you brighter glowing eyes. 5. 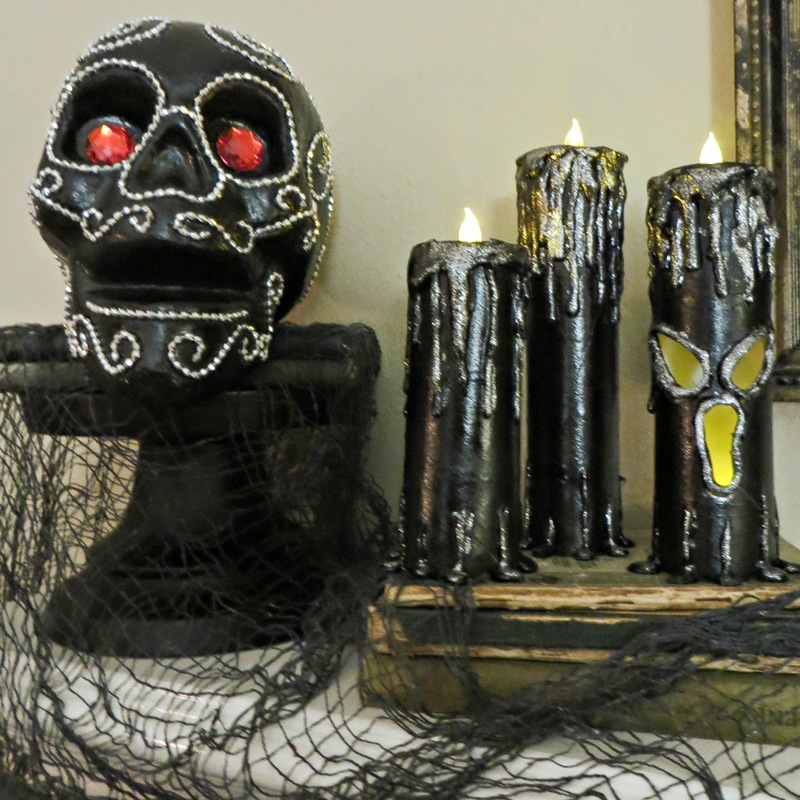 If you can't find the black tea lights, just put a piece of masking tape over the tea light flame and spray paint it. 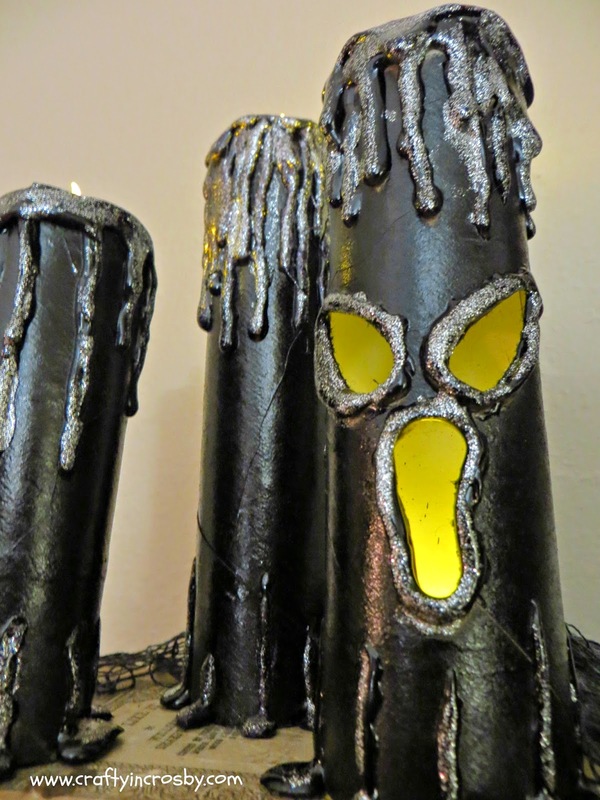 And last but not least - have fun and make lots of candles! 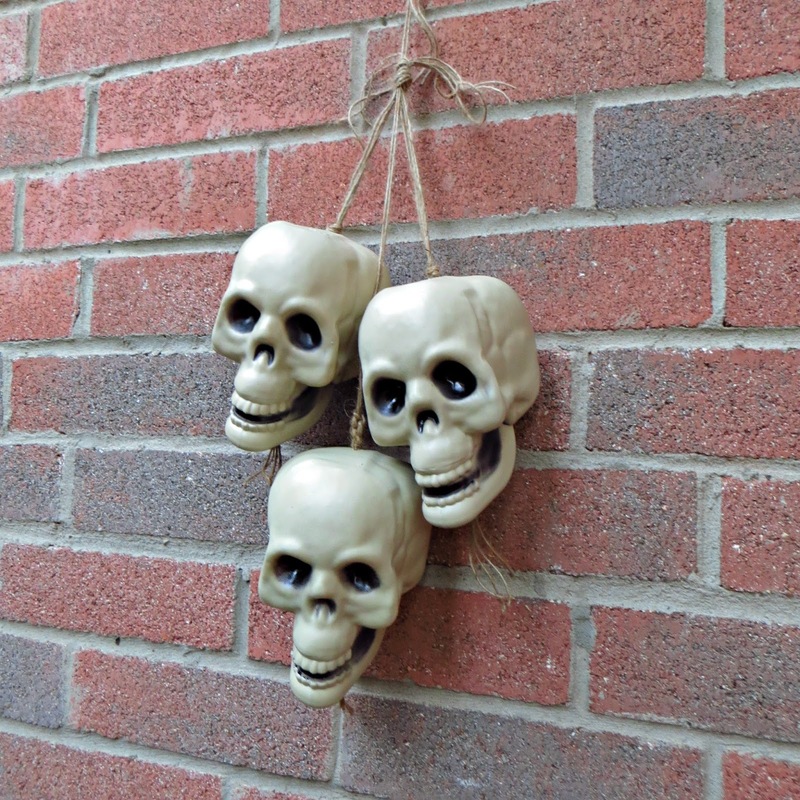 We are going to make as MANY of these as we can for Halloween this year. 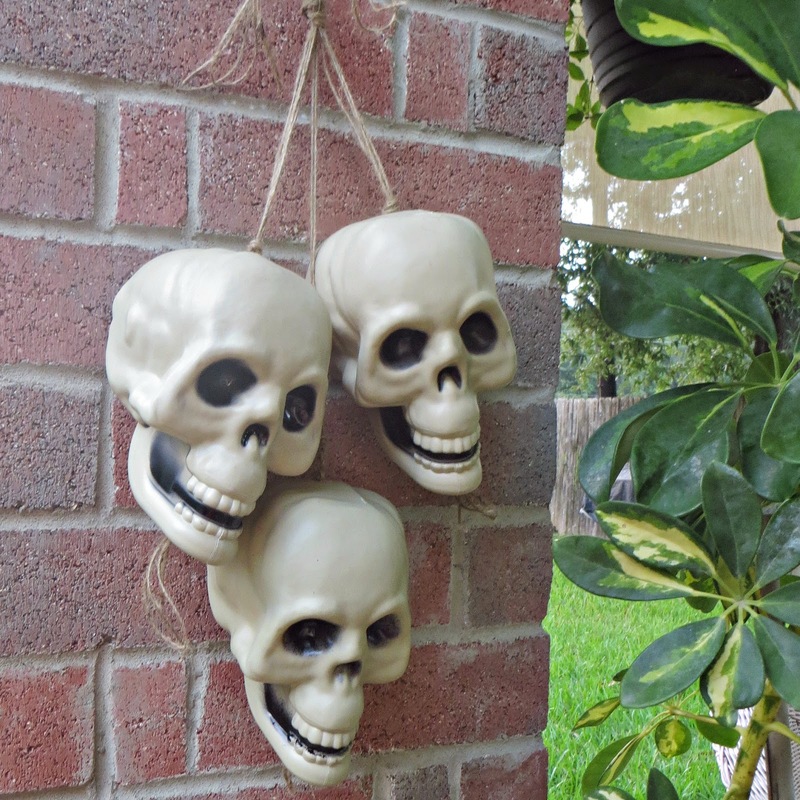 They will look awesome in all the nooks and crannies around the house. And since I promised Mr. 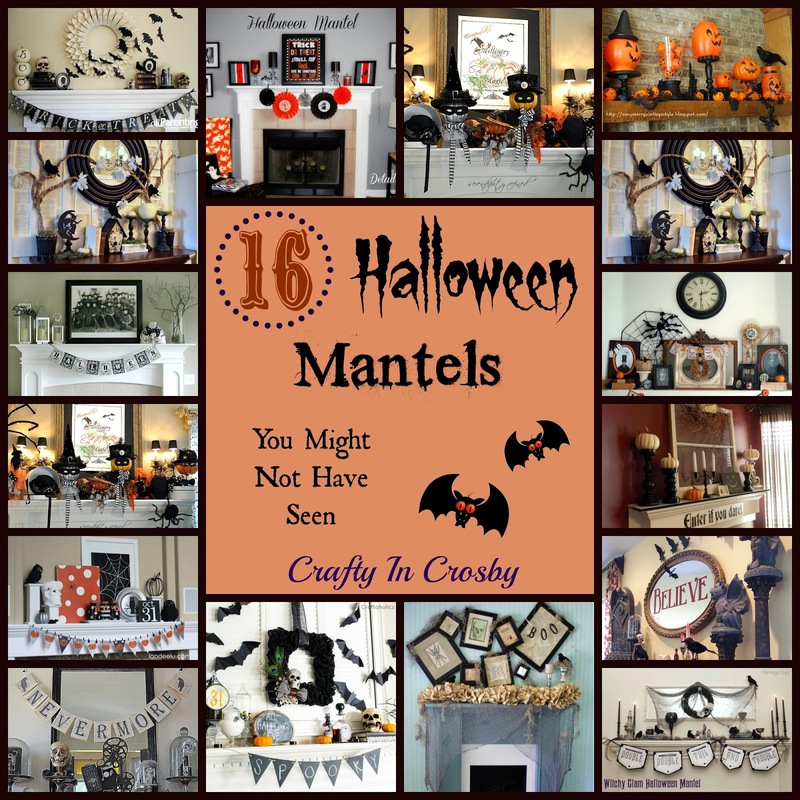 Crafty that we wouldn't spend a ton of money decorating for Halloween this year and these basically cost about $2 for a set of 3, we can make lots! 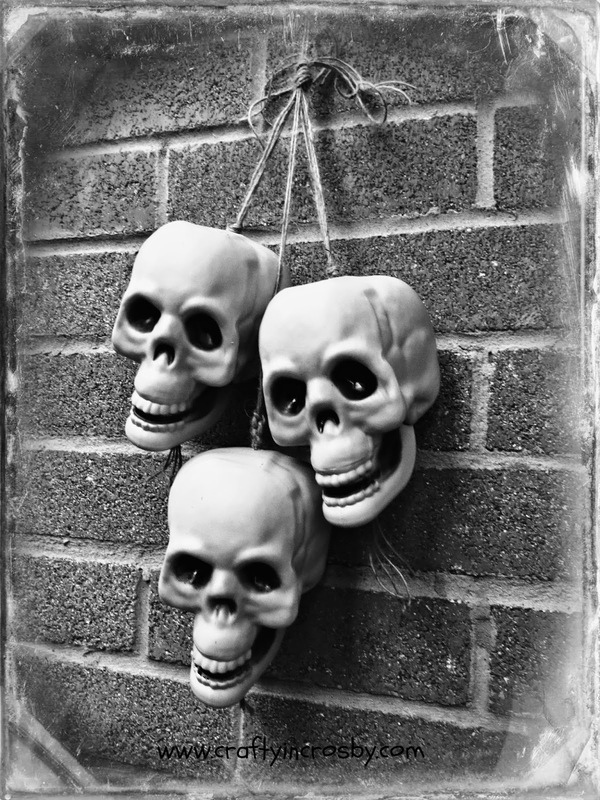 Only 44 Days until Halloween and 36 until our Annual Halloween Bash! Have to start practicing my wicked witch laugh!!! 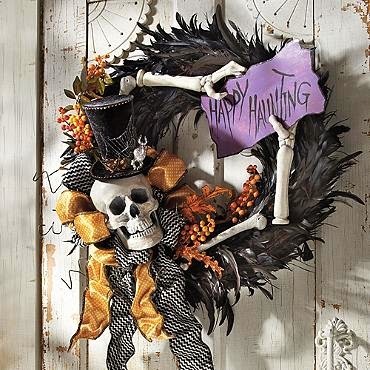 Every year my Mother-in-law gives me her Grandinroad Halloween catalog and every year, I drool over the beautiful decorations, especially the wreaths. 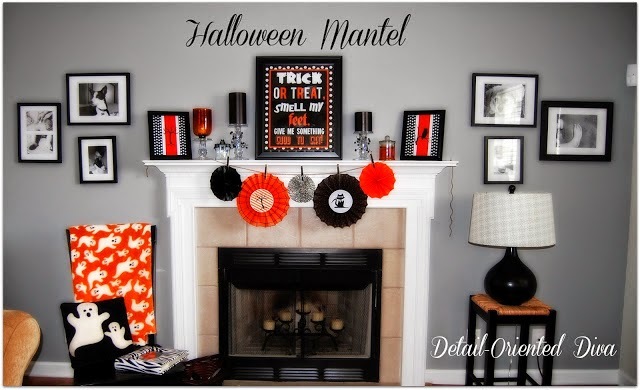 Along with all my other obsessions, Halloween and wreaths are my top two! 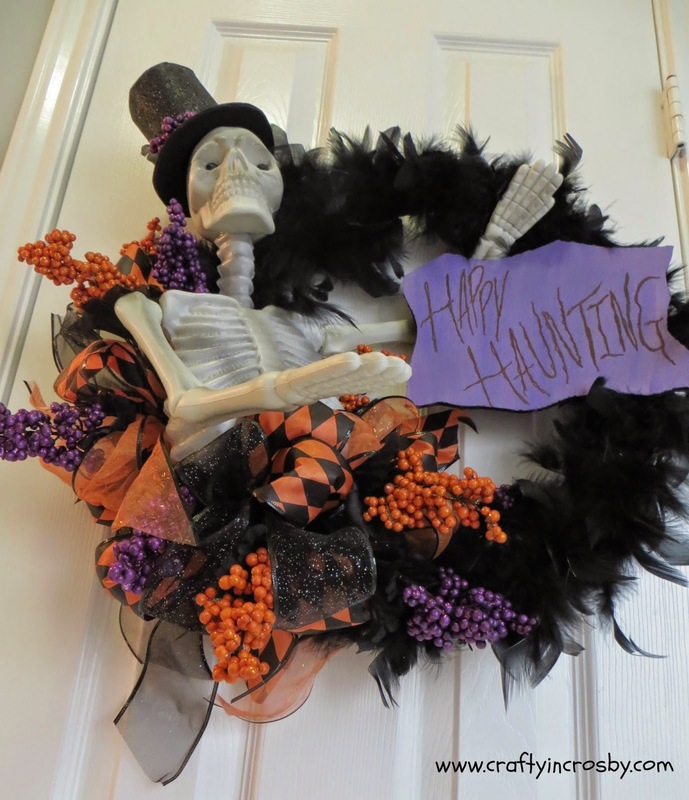 So when I saw their beautiful "Happy Hauntings" wreath, I decided that we just had to have one. Unfortunately, Grandinroad's is way over our budget, so I set out to see if we could come up with a less expensive version. 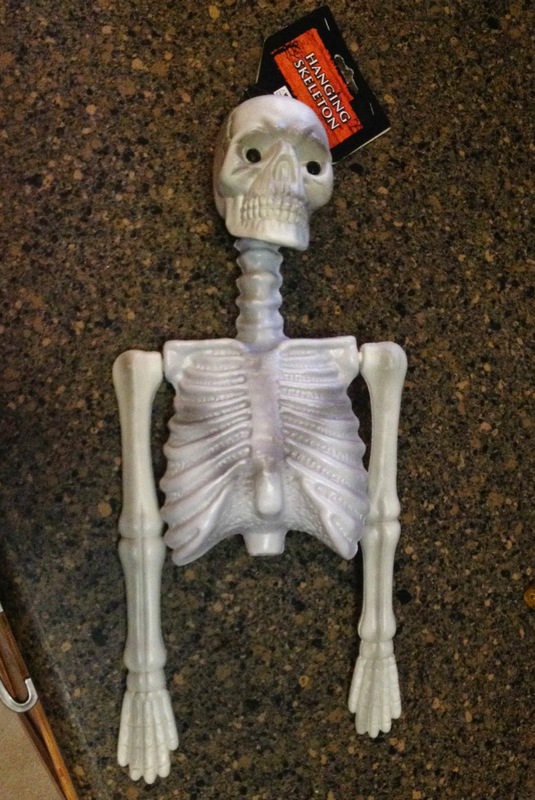 There are a few differences - theirs has only a skull, while ours has a torso and theirs has more detailed hands, but all in all, I think it's a pretty good copy. 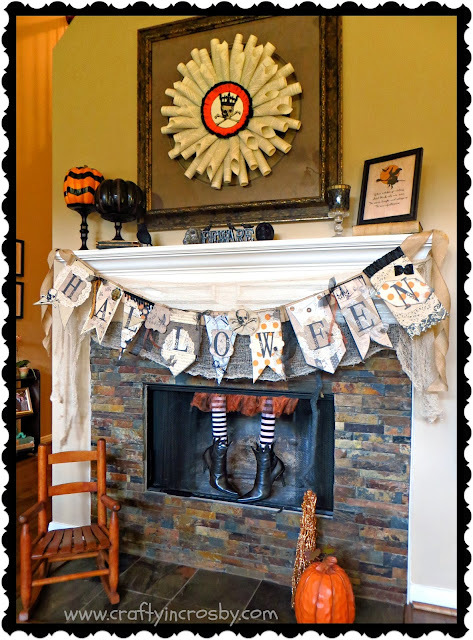 The biggest difference is that our version cost $12 to make and almost all the supplies came from the .99 Store and Dollar Tree! Not bad for $12 bucks! 1. 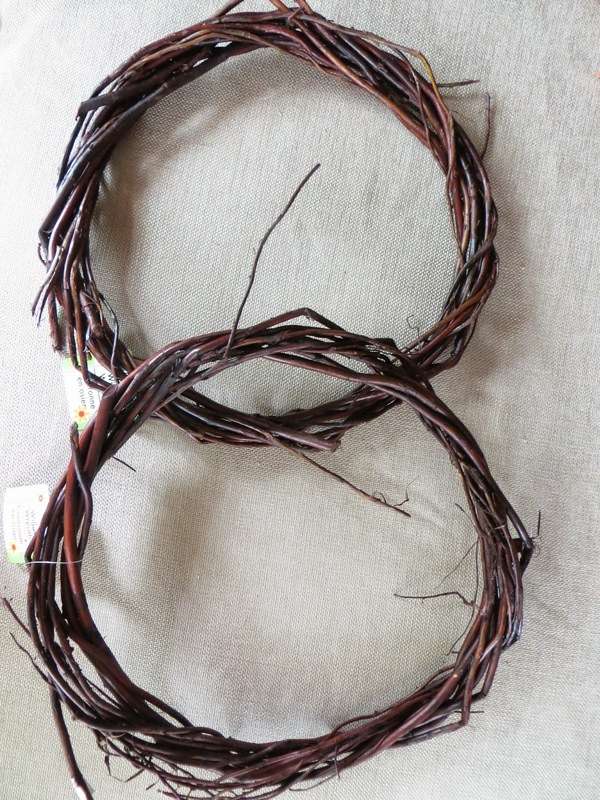 The base of the wreath started with a wire coat hanger that was opened up and formed into a circle. 2. 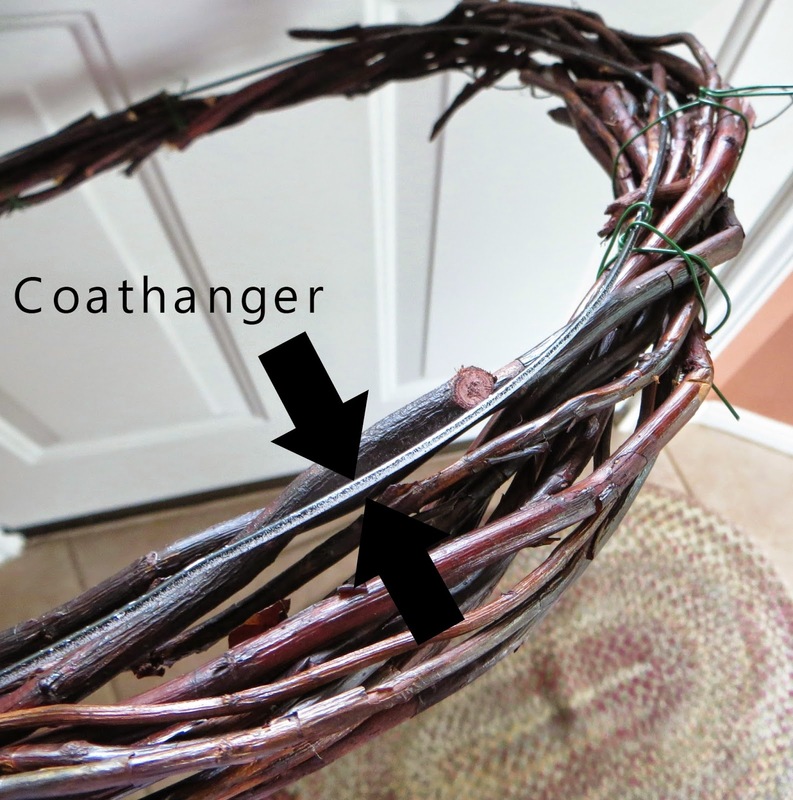 Cut one wreath and wire to the coat hanger circle. 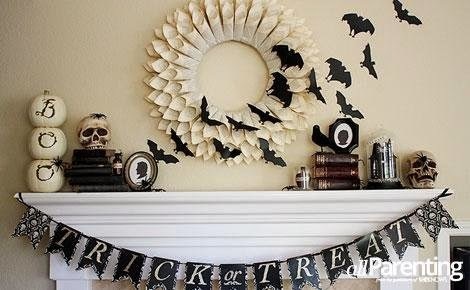 The wreath won't be large enough to cover the entire circle, so cut a piece out of the remaining wreath and wire it to the hanger to complete the circle. 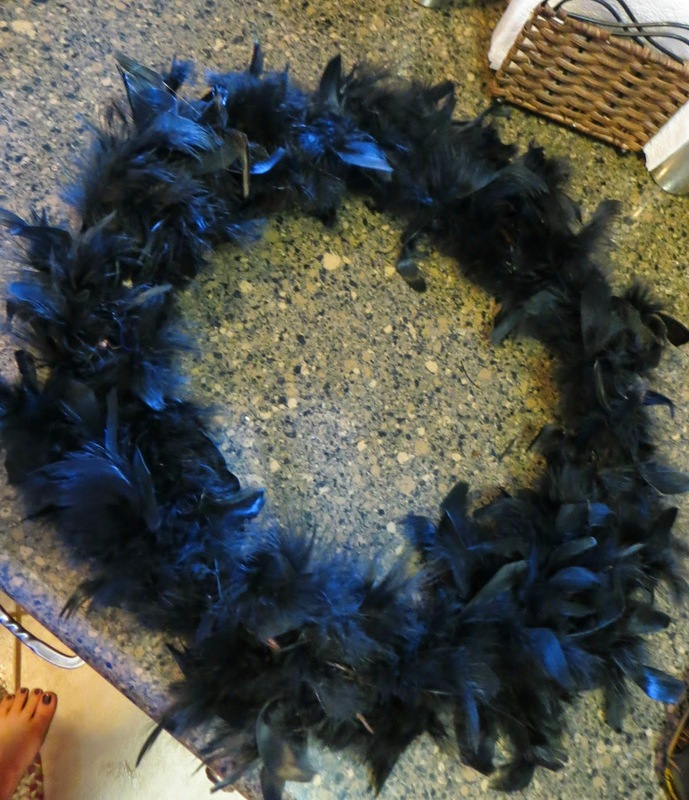 The wreath is only a base and will not be seen after you have glued the feather boas to it. I sprayed the coat hanger with black spray paint, but that's just my craft OCD kicking in - it's really not necessary. 3. 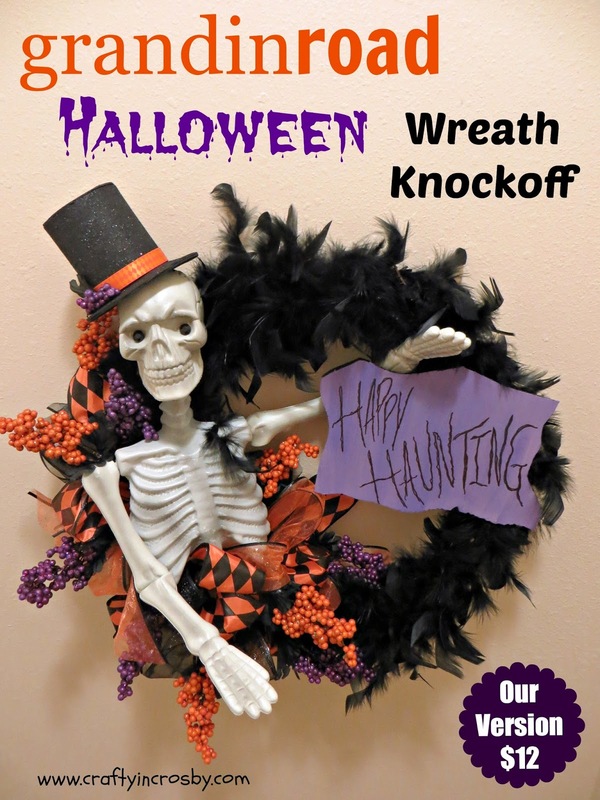 Hot glue the two boas to the top of the wreath. 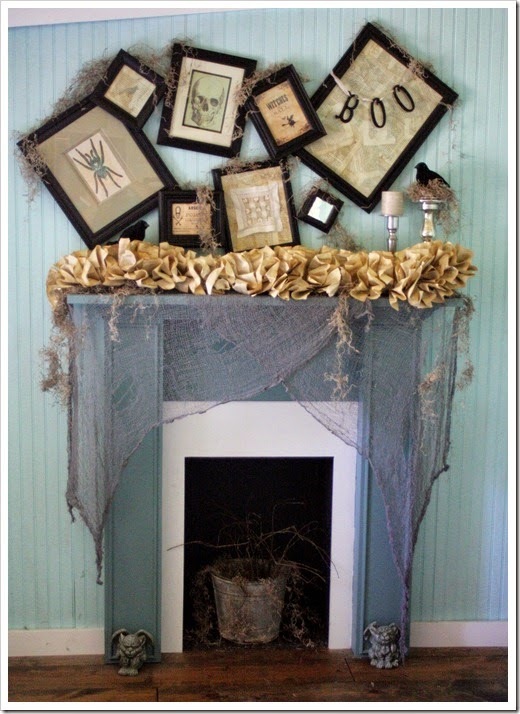 One boa will just go around the wreath once, so use both to make it fuller. 4. Now let's work on the skeleton. Here's what he looked like before he was posed - notice his straight stiff arms. To make him look more life like, I used a heat gun to heat up his elbows and bend the arms into a more natural position. 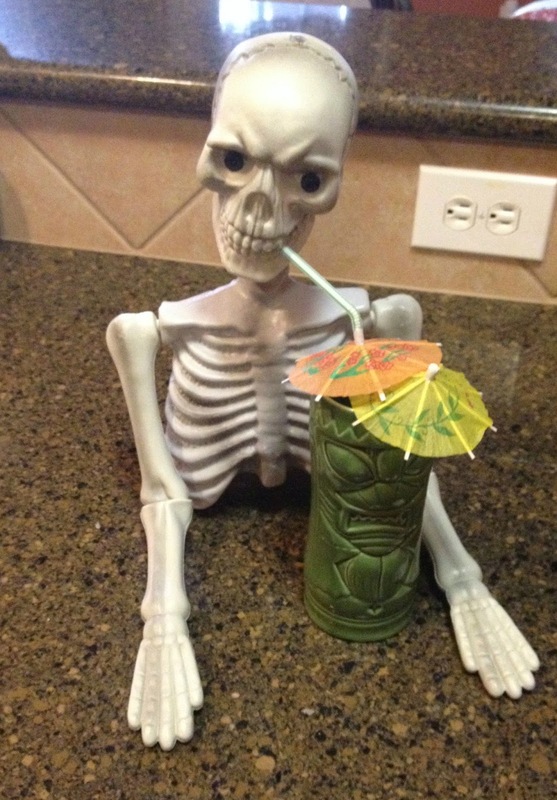 You can see how much more natural he looks here - enjoying a nice tropical drink! 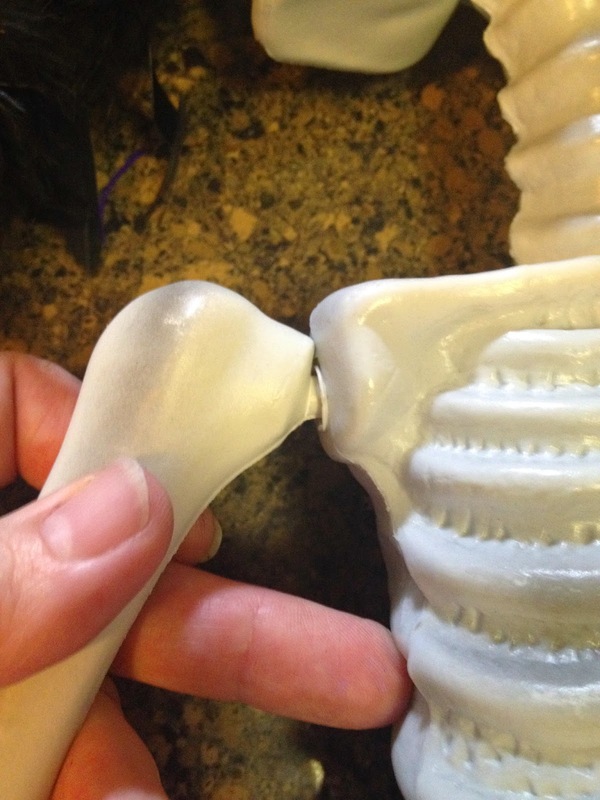 I also used the heat gun to tilt his left wrist forward just a bit. 5. 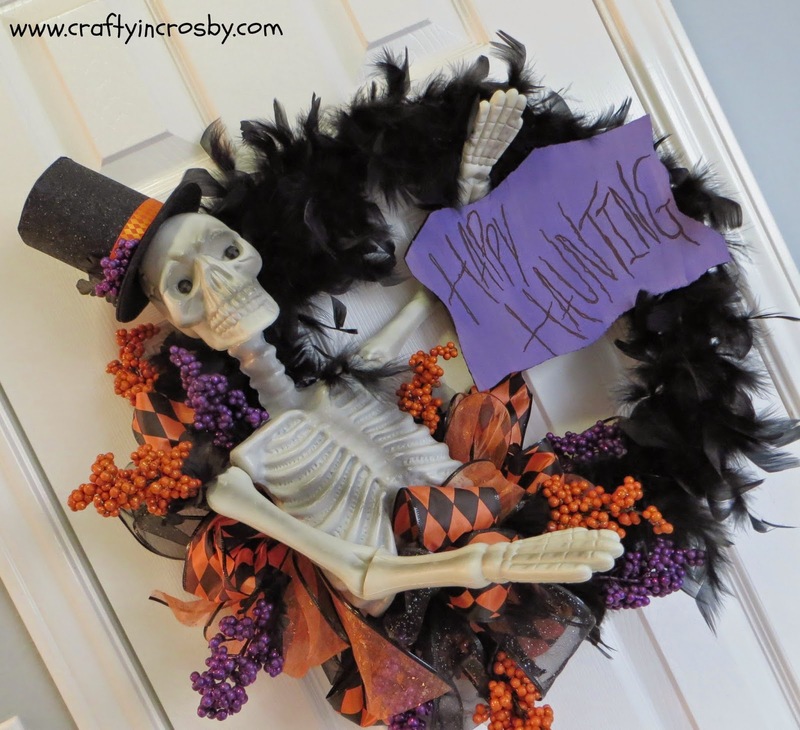 Now the skeleton can be wired on to the wreath. 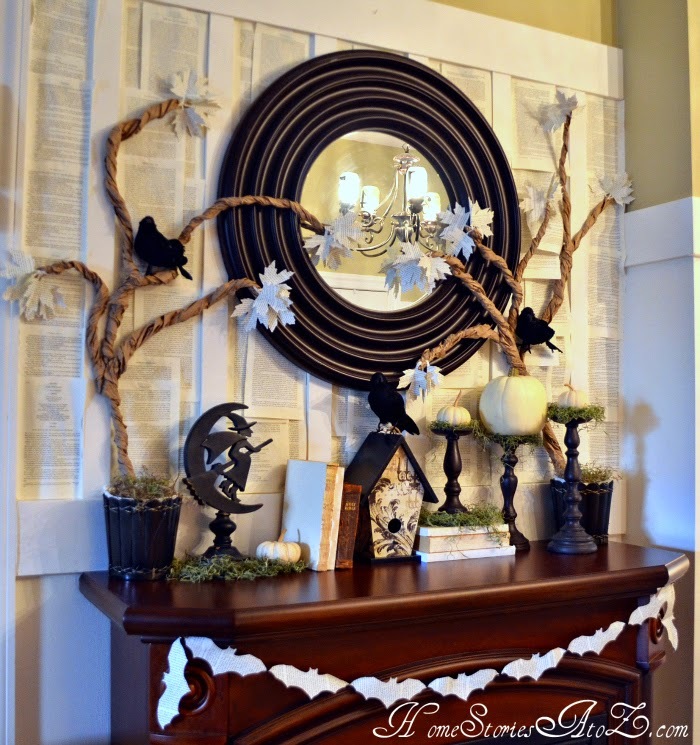 Cut small holes in his back on either side of the back bone and run floral wire through, then wire on to the wreath. Place one set of holes high and the torso and one set low. 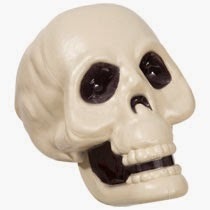 You will also want to hot glue the skull on to the neck so that it doesn't wobble. 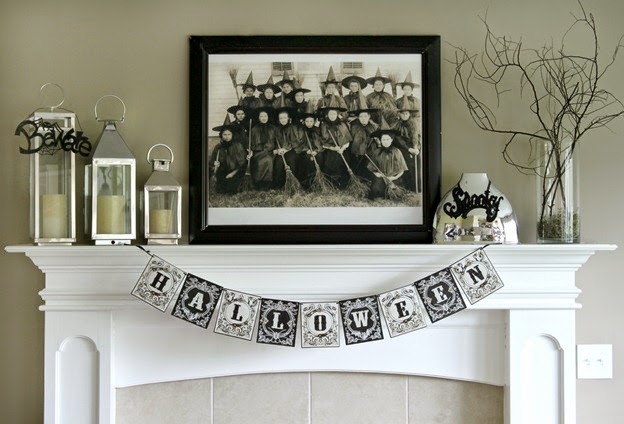 Happy Haunting on it with a sharpie. Hot glue a piece of wire on the back and wire the board to the wreath. 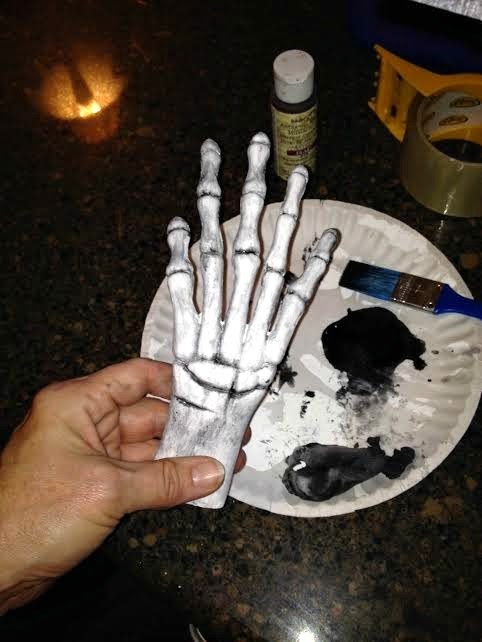 I also used a dab of glue to affix the "board" to the skeleton hand. 8. Make loops of ribbon and wire around the torso. Then cut the glitter stems apart and use them to fill in around the torso. And TA DA!!! 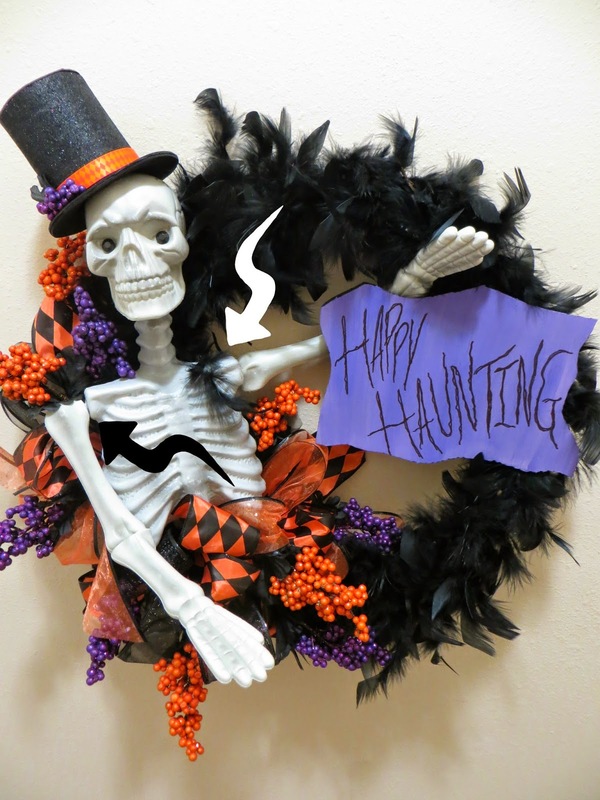 You will have a Grandinroad Happy Hauntings Wreath KNOCK OFF!!! Elegant and Cheap too!!! Maybe not as elegant as Grandinroad's version, but it works for me! Hope everyone had a great weekend! 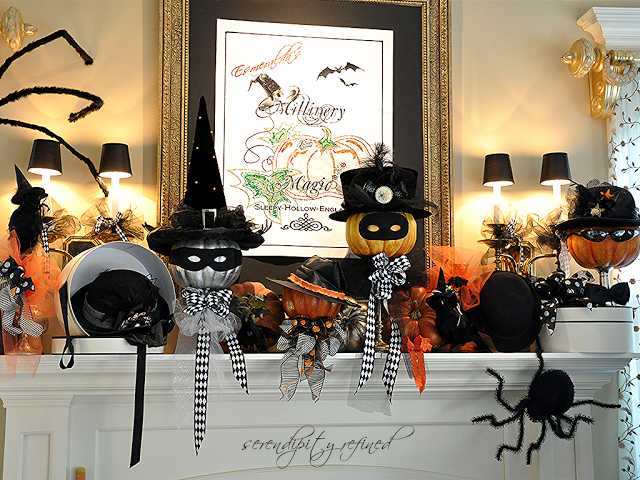 Leave us a line and tell us what you are working on for Halloween - we would love to see your creations!